Life insurance industry is a very competitive market and it pays to shop around for the very best deals. This is where we come in. When you are searching for Life Insurance you must be well-informed and well-advised to get the most out of your premium dollars. An experienced and independent agent who represents multiple insurance carriers can make a huge difference in what you pay for coverage. If you are 18, 26, 32, 45, 57, 64 years of age and older, need $50,000 or more of coverage, see how easy simple way to get California Life Insurance Quote... and Apply On Online. You can adjust the value of the Amount of Insurance and You even have choices to lock in your rates or the Term Length from 10 years, 15 years, 20 years, 25 years, 30 years, age 95, age 100, or to age 120. Our Free California Life Insurance Instant Quote Online will compare rates from many other top providers to find the best deal. Not everyone carries life insurance and some people debate if life insurance is necessary for everyone to have. While there are instances where life insurance is not necessarily practical, it is an important benefit not for the policy holder but for his or her beneficiaries. Life insurance is sometimes thought of as being expensive, but there are choices like Term Life that can make life insurance very affordable. The main idea is to carry sufficient coverage for your burial and for your dependents. In a nutshell, you need life insurance if you have anyone that currently depends on you for financial support. Term Life Insurance is becoming a popular choice because it is the least expensive plan and provides basic coverage. The amount of coverage you elect when you purchase the policy is the amount of your benefit, so if you buy a $150,000 term life policy your beneficiaries will receive a $150,000 payout. There is no cash value involved with Term Life Insurance as there can be with other policies, but the premiums are usually the lowest you will find by far. You can select different terms of coverage, such as 10 years or 20 years or 25 years or 30 years and your premium will change based on the term you choose. The only drawback to term life insurance is, your survival during the term elected. If you do not die during the term you choose, then there is no death benefit payout and your premiums are very simply gone. The good side to this, of course, is that you’re still living and you can buy another life insurance plan! provides no benefit to you as the policyholder, it can have a huge impact on your family, friends, or even a favorite charity. If your life insurance coverage is structured correctly, your beneficiaries will be able to take care of your burial without financial hardship and also survive on the benefits for an approximate number of years. If you can afford the coverage for lifelong benefits, your beneficiaries would then be set for their own life. 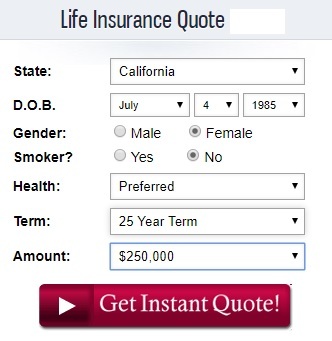 Get a Free California Life Insurance Instant Quote, Compare Rates and Apply Online Now.